Choose 1 or more styles and sizes here. This large size stamped sterling silver band has a satin finish to it and measures approximately 3/8" -7/16" wide. 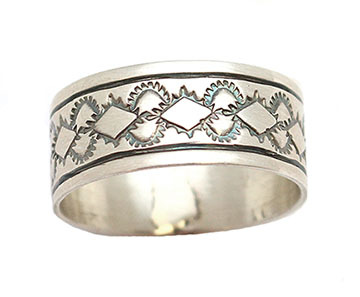 Handmade by Navajo artisan Bobby Becenti. Also available in a high polish finish. Available in size 14-17. Choose style and sizes when ordering.